This week’s theme for the wonderful Tara’s The Gallery is Portraits. 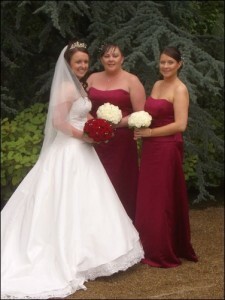 This is my friend Donna’s wedding on August 2008. My friends Lee-ann and I were her bridesmaids. I’m the one on the right. It was a beautiful day and I was four months pregnant with my second. He was scared to let me show until after the wedding, in case I didn’t fit into my dress he he. You look fantastic! Looks like a beautiful wedding too. What a beautiful photo of three lovely looking women. SWEET!!! Great interview! Can't wait to read it!